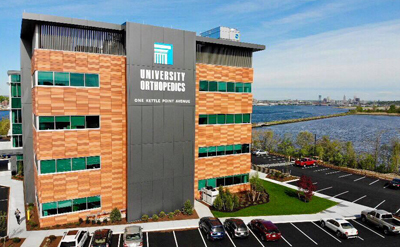 Mark Palumbo MD is a board-certified and fellowship-trained spine surgeon at University Orthopedics. He specializes in reconstructive surgery of the cervical, thoracic and lumbar spine for the adult patient. These operations function to relieve compression of the neurologic structures and to restore structural integrity to the spinal column. Dr Palumbo has special expertise in disorders of the cervical spine including extensive experience in cervical total disc replacement. His clinical and research interests encompass spinal stenosis, disc herniation, scoliosis and athletic injuries of the spine. Dr Palumbo was born and raised in Rhode Island. He attended Bishop Hendricken High School in Warwick and went on to receive his B.A. and Doctorate of Medicine from Boston University. He completed his orthopedic residency at Brown University followed by fellowship training in spine surgery at Case Western University in Cleveland, Ohio. Dr Palumbo serves as Professor and Chief of the Division of Spine Surgery in the Department of Orthopedics at the Alpert Medical School of Brown University. He serves as a consultant Team Physician for the Brown University Department of Athletics and is on the medical staff of Rhode Island Hospital, the Miriam Hospital and Westerly Hospital. Dr Palumbo is a fellow of the American Academy of Orthopedic Surgeons and a member of the North American Spine Society, the Rhode Island Orthopedic Society and the American Medical Association. He has received numerous teaching awards, published over sixty peer-reviewed articles and serves on multiple committees within the Brown University Department of Orthopedics and the national academic spine societies. On a personal note, Dr Palumbo resides in West Greenwich with his wife, Anne, and their three children. In his spare time he enjoys mountain biking, hiking, skiing and fishing. beneficial to patient to state "if your insurance covers it"! very willing to pick up where we left off. Dr. Palumbo was engaging and thorough. I was glad to receive his evaluation of my spinal condition. Very pleased with his attention to my situation and explanation to what was to be done. very pleased with the outcome to date. I was so impressed with Dr. Palumbo and his team. They were prompt, considerate, compassionate, respectful, and professional. I so thoroughly enjoyed this informative consultation that I asked Dr. Palumbo if he would consider treating me. I am so happy that surgery has been scheduled. Driving 40 min. to appointment, and then waitting 1hr 15 min. to be seen is not good pr. I am very happy the way He splaing to me my problem. Patient Testimonial - What can you say to the people who saved your mother’s life? March 24, 2013 — After Dr. Mark Palumbo removed a cancerous spinal tumor, Pat's mother is looking forward to enjoying her first cruise — with her daughter, Pat, and two granddaughters. Click here to read Pat's recollection of the care Dr. Palumbo provided her mother, who was suffering from a cancerous spinal tumor. See Dr. Palumbo and patient Roxanne Sardelli Greenway talk about the road to her "After." N Thakur, J Czerwein, J Butera, P Lucas and M Palumbo. Perioperative Management of Chronic Anticoagulation in Orthopaedic Surgery. Accepted for Publication 2009 JOURNAL OF THE AMERICAN ACADEMY OF ORTHOPAEDIC SURGEONS. M Tompkins, I Panuncialman, P Lucas and M Palumbo. Spinal Epidural Abscess. Accepted for Publication 2009 JOURNAL OF EMERGENCY MEDICINE. JOURNAL OF THE AMERICAN ACADEMY OF ORTHOPAEDIC SURGEONS. M Valdes, N Thakur, S Namdari, D Ciombor and M Palumbo. Recombinant Bone Morphogenic Protein-2 in Orthopedic Surgery: A Review. ARCHIVES OF ORTHOPEDIC AND TRAUMA SURGERY. Published online (ahead of print) March 12, 2009. M Valdes, D Moore, M Palumbo, P Lucas, A Robertson, J Appel, M Ehrlich and H Keeping. rhBMP-6 Stimulated Cells Enhance Posterolateral Spinal Fusion in the New Zealand White Rabbit. SPINE JOURNAL 2007 May-June; 7 (3): 318-325. Epub April 6, 2007. D Spenciner, D Green, J Paiva, M Palumbo and J Crisco.The multi-directional bending properties of the human lumbar intervertebral disc. R Tachjian, S Majercek, W Biffle, M Palumbo and W Cioffi. Halo-vest immobilization increases early morbidity and mortality in elderly odontoid fractures. JOURNAL OF TRAUMA 60(1):199-203, 2006. R Banerjee, M Palumbo and P Fadale. Catastrophic Cervical Spine Injuries in the Collision Sport Athlete, Part II – Principles of Emergency Care. R Banerjee, M Palumbo and P Fadale. Catastrophic Cervical Spine Injuries in the Collision Sport Athlete, Part I – Epidemiology, Functional Anatomy and Diagnosis. M Palumbo, M Valdes, S Sheik, and P Lucas. Posterolateral intertransverse lumbar arthrodesis in the New Zealand white rabbit model: I – Surgical anatomy. A Hilibrand, M Fye, S Emery, M Palumbo and H Bohlman. Increased rate of arthrodesis with strut grafting after multilevel anterior cervical decompression. A Hilibrand, M Fye, S Emery, M Palumbo and H Bohlman. Impact of smoking on the outcome of anterior cervical arthrodesis with interbody or strut grafting. K Riew, A Hilibrand, M Palumbo, N Sethi and H Bohlman : Diagnosing basilar invagination in the rheumatoid patient: The reliability of radiographic criteria. K Riew, A Hilibrand, M Palumbo and H Bohlman : Anterior cervical corpectomy in patients previously managed with a laminectomy: Short-term complications. A Hilibrand, G Carlson, M Palumbo and H Bohlman: Radiculopathy and myelopathy due to adjacent segment degeneration following anterior cervical arthrodesis. J Gastel, M Palumbo, M Hulstyn, P Fadale, and P Lucas : Emergency removal of football equipment : A cadaveric cervical spine injury model. ANNALS OF EMERGENCY MEDICINE Volume 32 (4): 411-417, 1998. M Palumbo, M Hulstyn, P Fadale, T O’Brien and L Shall : The effect of protective football equipment on alignment of the injured cervical spine - Radiographic analysis in a cadaveric model. AMERICAN JOURNAL OF SPORTS MEDICINE Volume 24(4) : 446-453 , 1996. M Palumbo and P Fadale : Open repair of the ruptured achilles tendon. JOURNAL OF ORTHOPAEDIC TECHNIQUES 2(1): 41 - 44 , 1994. J Jupiter, A Kour, M Palumbo and M Yaremchuk : Limb reconstruction by free tissue transfer combined with the Ilizarov method. PLASTIC AND RECONSTRUCTIVE SURGERY 88(6): 943-951, 1991. I Yablon, M Palumbo, E Spatz, R Mortara, J Reed and J Ordia : Nerve root recovery in complete injuries of the cervical spine. SPINE 16(10): S518-521, 1991. R Banerjee, P Fadale and M Palumbo. Cervical Spine Injuries in the Athlete. In Johnson DH and Pedowitz RA (eds. ): Practical Orthopaedic Sports Medicine and Arthroscopy. Lippincott and Wilkins, 2007. pp.53-70. M Palumbo & M Barnum. Operative treatment of cervical spine disorders. In Murphy, DR (ed. ): Conservative Management of Cervical Spine Syndromes. Appleton and Lange, 1999. pp. 593-604. M Palumbo, P Lucas and E Akelman: Lumbar spinal stenosis - A review. RHODE ISLAND MEDICINE Volume 78(11): 321-323, 1995. 4th Annual Meeting - Surgical Decision Making and Technological Advancements in Spine Surgery. 3rd Annual Meeting - Surgical Decision Making and Technological Advancements in Spine Surgery. Cervical spine kinematics following total disc replacement mimic intact behavior. I Madom, D Paller, J Crisco and M Palumbo. D Spenciner, D Green, J Paiva, M Palumbo and J Crisco.Can the multi-directional bending properties of the lumbar intervertebral disc be predicted from the components of the principal anatomical axes? D Spenciner, D Green, J Paiva, M Palumbo and J Crisco.An apparatus for determining the multi-directional bending properties of the human lumbar intervertebral disc. Improved arthrodesis after anterior cervical decompression through strut grafting. Diagnosing basilar invagination in the rheumatoid arthritis patient: Are plain radiographic criteria reliable? Open repair of the ruptured achilles tendon. J Gastel, P Fadale, M Hulstyn and M Palumbo. Multi-directional bending stiffness of the human lumbar intervertebral disc. Posterolateral lumbar arthrodesis in the New Zealand White rabbit model: Surgical technique. Posterolateral lumbar arthrodesis in the New Zealand White rabbit model: Surgical Anatomy. M Valdes, M Palumbo, A Robertson, P Lucas and M Ehrlich. Vascularization of a DBM carrier mass in the lumbar posterolateral fusion rabbit model. Enhancing posterolateral spinal fusion with rhBMP-6 exposed osteoprogenitor cells. Valdes, M; Keeping, H; Robertson, A; Appel, AJ; Moore, DC; Palumbo, M; Lucas, P; Ehrlich, MG.
Posterolateral intertransverse lumbar fusion in the New Zealand White rabbit model. Part I- Surgical Anatomy. M Valdes, M Palumbo,A Robertson, P Lucas & M Ehrlich. Posterolateral intertransverse lumbar fusion in the New Zealand White rabbit model. Part II- Surgical Technique. BMP-6 exposed osteoprogenitor cells promote posterolateral intertransverse spinal fusion in the New Zealand white rabbit. M Valdes, A Robertson, H Keeping, M Palumbo, P Lucas, S McAllister and M Ehrlich. Vertebral artery injury during anterior cervical surgery. W Bulczynski, P Lucas and M Palumbo. Differentiation of rabbit bone marrow stromal cells on a BMP-6 containing osteoinductive extracellular matrix . Stenosis of the Thoracic Spinal Canal. Protective football equipment and cervical spine malalignment: A cadaveric injury model. M Hulstyn, J Gastel, M Palumbo, & P Fadale. 63rd Annual Meeting of American Academy of Orthopaedic Surgeons. Spine injuries in the athlete. Spinal cord injuries in football. Why Surgery Is Not Successful. 3rd Annual Surgical Decision Making and Technological Advancements in Spine Surgery. Is There a Role for Cervical Total Disc Replacement? Eighth Annual New England Worker’s Compensation Educational Conference. The Effect of Protective Football Equipment on Alignment of the Injured Cervical Spine - Radiographic Analysis in a Cadaveric Model. An evolutionary perspective of elbow function. Surgical management of cervical spine injuries with quadriplegia. RI Workers Compensation /Beacon Mutual Ins. Co. Compensation Low Back Pain : Can Its Impact On Industry Be Controlled?